The fabulous team of Jeanne Willis and Tony Ross have brought us a fantastic story to read to our Moms! Yep, our Moms. 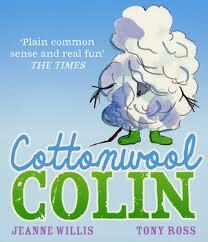 By the time we finished laughing and gasping through Cottonwool Colin, the consensus was – this is a book for Moms! This book is all about tiny mouse Colin Smally, the youngest and smallest of ten mouse siblings. So small that his Mom only agrees to allow him outside into the great big world if she can wrap him in cottonwool. Now he would be safe from the elements, from falling, or worse, having something landing on him! All would be well. But when Colin (wrapped in cotton) gets mistaken for a snowball and tossed into a freezing river, everything suddenly seems very dangerous. And it is – he is chased and needs to swim to escape and then chased again . . . When Colin, (sans cottonwool) ends up back at his mouse cave, his mother is very upset. “Colin, ” she shrieked. “Anything could have happened to you! “Everything did happen to me, ” he whooped. I am a teacher but I am also a Mom and I have to admit that, like Colin, my students are probably smarter than me on this one! Breathe, let it go, don’t worry so much . . . This entry was posted in Picture Book Love and tagged favourite illustrators, fiction, Jeanne Willis, making connections, picture books, Tony Ross by carriegelson. Bookmark the permalink.